At Redeemer, we follow the orders of service found in the Lutheran Service Book. We celebrate the Divine Service (service with Holy Communion) every Sunday at the 10:45 a.m. service, and on alternating Saturday evening services at 6:30 p.m. and 8:00 a.m. Sunday morning services. We also hold special Wednesday evening services during the seasons of Lent and Advent. The dress code ranges from casual to Sunday best. Attendance varies between services and times of the year, but on average Redeemer has about 150 people in worship every weekend divided between our three services, and we often have visitors. The Sunday 10:45a.m. service has the most people in attendance, while the Saturday 6:30p.m. service has less. Sunday 8:00a.m. service attendance falls somewhere in between. Children of all ages are welcomed at every service. Year round Sunday school for children age three to seventh grade meets between services at 9:15 a.m. Children are encouraged to sit with parents during worship. There are Bible centered activity bags available and more helpful ideas on how to incorporate children into worship can be found HERE. Visitors to our congregation who desire to receive the Sacrament are asked to please speak with the Pastor before service. Our congregation, along with the majority of Christian denominations (Catholic, Orthodox, etc.) practices closed Communion. 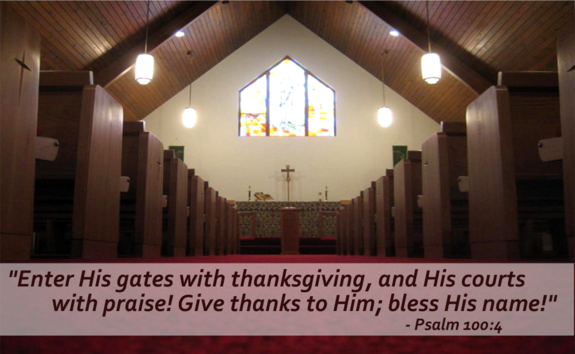 Visitors are welcome to approach the altar to receive a blessing during Communion. All members of our congregation have been through some form of instruction (either as adults or children) before participating in this Sacrament. Confirmation classes for children begin at 5th grade and students who complete this course of study have their first communion in 7th grade. Adult instruction classes are held at various times of the year. Please speak to the Pastor if you would like to become a member of Redeemer and receive Holy Communion. Before leaving, visitors are encouraged to sign our Guest register located at the front entrance. Those interested in learning more about Redeemer Lutheran can indicate that on the form. Members stay connected with the happenings at Redeemer through weekly bulletin notices, monthly newsletters, and emails. Accompanied by the majestic tones of a pipe organ, we sing an opening hymn, a sermon hymn and a closing hymn from the Lutheran Service Book. We sing additional hymns during the distribution of Holy Communion. Special music from both children and adult choirs and handbells are also used. Parking is in the adjacent lot on the east end of the church, just off Kennedy Avenue.